Potetially Active Volcanoes of the Western United States. | Chaos Sweeps Away the World We Know! The Disaster, current events & Catastrophe Blog. Forecasts for 2014 to 2022. Read tomorrows news today! Plus current economic, commodities, stock indices and financial news. 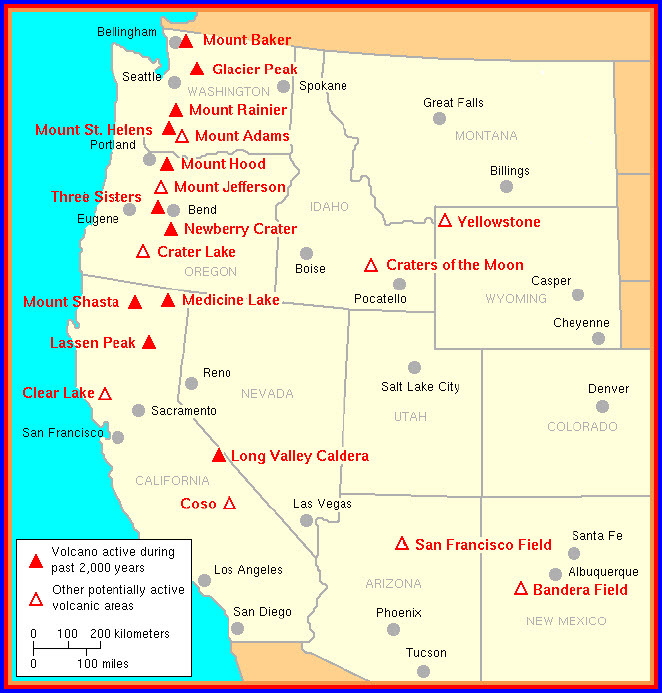 July 31, 2012 – – Potentially Active Volcanoes of the Western United States: There are 14 volcanoes, on the map above, that have been active in the last 2,000 years. Another nine are potentially active. Mount St. Helens is most the notorious for its catastrophic eruption on May 18, 1980, at 8:32 am PDT, which was the deadliest and most economically destructive volcanic event in the history of the United States. Fifty-seven people were killed; 250 homes, 47 bridges, 15 miles (24 km) of railways, and 185 miles (298 km) of highway were destroyed. However, this was a small eruption compared to those of the past. The Volcanic Explosivity Index (VEI) was devised by Chris Newhall of the U.S. Geological Survey and Stephen Self at the University of Hawaii in 1982 to provide a relative measure of the explosiveness of volcanic eruptions. The lowest value is 0, and the highest is 8. Kilauea is a VEI 0 example; It’s non-explosive and there are many occurrences of these types of volcanoes around the globe. Mount Etna is a VEI 3 example; it’s severe and there are roughly 870 occurrences in the last 10,000 years. Mount St. Helens is a VEI 5 example; it’s violent with 165 occurrences. Krakatau (Indonesia) is a VEI 6 example; it’s colossal with 50 occurrences. Tambora (Indonesia) is a VEI 7 example; it’s super-colossal with 5 occurrences. The Long Valley Caldera is a VEI 7 example shown on the map. Its last eruption was 760,000 years ago. The Yellowstone Caldera is a VEI 8 example, its’ mega-colossal and is on the map in Wyoming. Fortunately, the last eruption was 640,000 years ago. There have been zero occurrences of this type of eruption, over the last 10,000 years. VEI 6 and especially 7 and 8 eruptions are world changers with drastic consequences for our planet. This entry was posted in Bolivia, Chile, Chile-Bolvia, Events, Fiji, Indonesia, Japan, Misc, Miscellaneous, Nature, New Zealand, News, Papua New Guinea, Papua New Guinea, Peru, Philippines, Ring of Fire, The Solomom Islands, United States, Volcanoes and tagged active volcanoes, alaska volcano, california, colorado, idaho, kilauea, krakatau, krakatoa, long valley caldera, may 18 1980, mount etna, mount st. helens, mount st. helens may 18 1980, new mexico, oregon, super volcano, tambora, The Master of Disaster, vei, volcanic explosivity index, washington state, western united states volcanoes, wyoming, yellowstone caldera. Bookmark the permalink. 1 Response to Potetially Active Volcanoes of the Western United States.